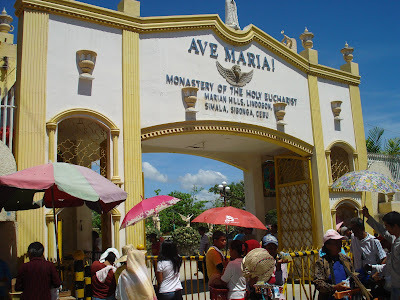 One weekend, our family have decided to visit the Monastery of the Holy Eucharist in Lindogon, Simala, Sibonga. It was 13th day of the month, so you would expect a lot of people who will do their share of faith. As you enter the sacred place, start your penance by lining up for the visit to the sacred place of the Virgin of Simala. The lined maybe long, and the time maybe as well, but once you reach the sacred area, it is worth the wait. If you can't be at the mass at 10:00 am because you have been in the lined for long, you can catch some during the 3:30pm mass. Mass for 13th day of the month is at 10:00 am and 3:30 pm. After some time of reflection, enjoy yourself by their pond's full of Koi fish. Or, you can also help some of the locals by having foot spa. For Php50.00 pesos, a soothing and relaxing feeling graces you. Not only you have a spiritual cleansing, you also feel light as you walk out of the monastery. Monastery of the Holy Eucharist.